Fresh off of a great experience at Princeton last weekend, the team once again packed up the caps and balls, this time heading to Middlebury for the first New England Conference Tournament of the 2015 season. We arrived on Friday night, getting some extra time for team bonding – we all shared a few laughs watching “50 Shade of Grey” at the local movie theater, followed by an awesome team dinner where we had a few more laughs. After, we headed to sleep early, knowing we had a big day ahead of us. Saturday morning we had a big breakfast at our hotel before driving to the beautiful Middlebury Natatorium, where the tournament was already underway. Our first game was against the home team, the Middlebury Panthers. Although the Panthers got out to a quick lead, the Big Green managed to put away a couple of goals, making the final score 7-3, Middlebury. After a delicious lunch from Noonie’s Deli (a DWWP classic), the Big Green faced off against the squad from Boston College. Both the Dartmouth offense and defense were much more coordinated and generally looked a lot better in this game; the Big Green beat the Boston Eagles 6-2. Although exhausted, the Dartmouth women only allowed 3 goals from Northeastern in their final game of the day, a true testament to the Big Green defense and goal tending prowess by Shelley Wenzel ’14 (#1). Happy with the final score of 13-3, the Dartmouth women made it back to the hotel, ready to get some rest before their final game on Sunday. 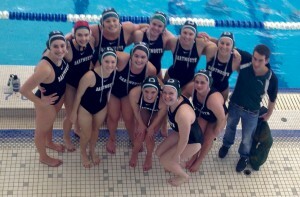 With only a single game on Sunday, the Big Green was motivated to play their best against University of Massachusetts. Although off to a slow start in the first quarter, the Big Green ended up with a very productive offense later in the game, with goals flying into the cage left and right, including from Adina Harri ’18 (#5) – her first ever water polo goal – and several from Carolina Ardila-Zurek T’16 (#10). Although tired, the team was happy with the 11-1 final score and even happier to be headed back to Hanover! 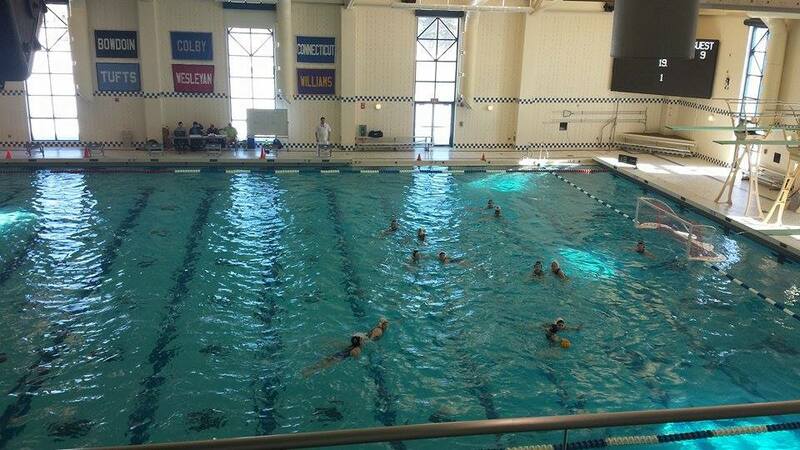 We are so excited to have started the season off so well, and even more excited to play the next New England Conference Tournament at our own Upper Valley Aquatic Center Pool in White River Junction, VT the weekend of April 11th. 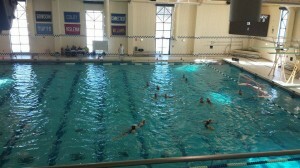 For the CWPA schedule and scores, please visit this site. This entry was posted in General by . Bookmark the permalink.